the four principles of drawing (angles, plumb lines, proportions, and positive/negative shapes). Basic instruction in perspective will also be covered. Creative drawing exercises will provide the student with the knowledge and skill to draw any subject. 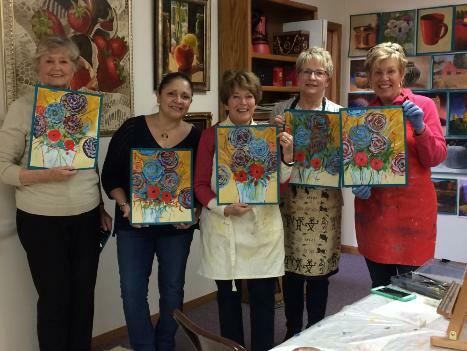 Enjoy demonstrations from the instructor as well as critiques and lots of encouragement. Handouts included. Supply List: Pencils (any kind). 8 1/2 x 11 regular print paper. Tablet of tracing paper. 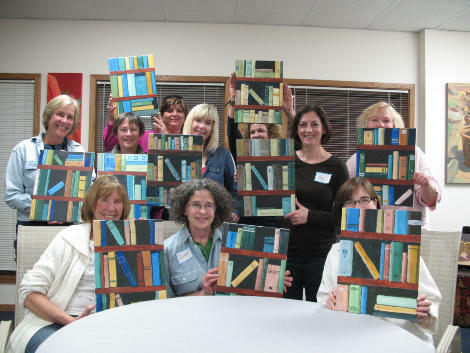 This is the perfect class for anyone who has put off the joy and thrill of learning to paint. Following the instructor's step-by-step process, you will be amazed at what you accomplish. 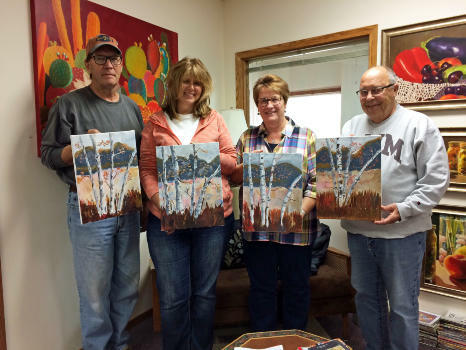 This class is a great introduction to brush, canvas, and paint; while learning lots of basic and essential painting techniques. 3-4 paintings will be done. Most of all -- a confidence building experience. Handouts included. Supply List: If you have materials and want to use them, the cost for the class is $120.00. The supply list for this class is the same as Oil Painting-Any Level. Cost: $160.00. All materials provided. "I've taken workshops all my life and learned more today than in any of the other workshops", a frequently heard comment from Sharon's students. Enjoy and learn from her informative presentation (handouts, examples, and demonstrations) that is condensed and simplified: explaining just what the artist thinks, sees, and really paints. Fundamental skills and techniques will include color mixing, color perspective, values, affect of light on form, composition and much more. Students can paint from their photos, imagination, or set-up a still life. Group/individual critiques. Handouts provided. Students need some painting experience for this class. Supply List: Paints: Cadmium Yellow Medium, Cadmium Red Light, Alizarin Crimson, Ultramarine Blue, and White. Any others you would like. Brushes: 4 or 5 (a variety of sizes). Canvas: 11 x 14 or larger. Miscellaneous: Odorless turpentine, palette knife, paper towels, palette, can or jar (with a lid) for turpentine. Cost: $30.00 for either the morning or afternoon class. $45.00 for the whole day. Pay when you attend class. This is an ongoing weekly class which provides the student the option of attending classes when it fits their schedule. Anyone can start this class at any time. If you are beginning or want to enhance your skills with one on one instruction, try private lessons. The medium you choose can be watercolor, oil, drawing,or acrylic. Call or email to schedule a time. Apply the background with a palette knife after mixing the colors to the right consistency. Dip the string into paints, swirl onto the canvas and pull. So simple and exciting!! Supply List: An old apron or shirt. Bring a piece of cardboard or box lid(larger than12x16) to carry the wet piece. Acrylic drys fast, but this is still wet for a day. All other materials provided. Cost: $40.00. One 12x16 painting will be done. Besides the listed class times, you can bring in your own group (4-8 people). Call to schedule a time that is convenient for your group. Evenings and weekends are also available. This process is more fun than you can imagine! So easy, relaxing and creative. Pick your colors, mix them in cups, pour onto the canvas and watch the magic happen. Supply List: An apron or old shirt--it's a messy experience. Bring 2 pieces of cardboard or box lids(larger than 8x10) to carry the wet pieces. All other materials are provided. Cost: $40.00. Two 8x10 paintings will be poured. Besides the listed classes, you can bring in your own group (4-8 people). Call to schedule a time that is convenient for your group. Evenings and weekends are also available. No painting experience necessary. It's all about having a good time! Fun and easy instruction. Just follow the step-by-step instruction and recreate the featured paintings. Acrylic paint is used, so your piece will be dry to take home. Enjoy the relaxed, social environment. Be prepared to surprise yourself with an amazing piece of art. Supply List: All materials are provided. You will need an apron or old shirt. CLASS SCHEDULING: Get your group together (4-10 people). Call or email me to schedule a time and date. Evenings and weekends are also available for class. Bring your group, family, party, or club. Select from the following paintings or the paintings shown above (Painting with Friends) and schedule your own time and date. Cost: $40.00. All materials provided.